Google is the kind of company that you know is going to stay relevant in decades to come. I'm 100% bullish on them. Yeah, they are not going away anytime soon. I really believe that we're living in a golden age of tech. The companies that are thriving right now, the likes of Tesla, Google, Amazon, they will change this world one day. And their respective stocks will react accordingly. And I'll be there when it happens... I hope. I haven't bought shares in 5 years and haven't sold either but if price drops under 920 I'm buying another huge lot. Really? I didnt think this was that big of a deal. I guess some people are just bored. Before we get into the subject, Alphabet, Inc. is a holding company and engages in acquisition & operation of different companies and operates through the Google and Other Bets segments. The Google segment includes Internet products such as the Google Search engine, Google Ads, Google Commerce, Google Maps, YouTube, Apps, Cloud, Android, Chrome, Google Play as well as hardware products, such as Chromecast, Chromebooks and the well known Nexus Smartphones. Other Bets segment includes businesses such as Access or Google Fiber, Calico, Nest, Verily, GV, Google Capital, X, and other initiatives. Alphabet Inc is headquartered in Mountain View, CA. Google (NASDAQ:GOOGL) presentation of the new version of its Operating System for Smartphone and Tablets is just a few days away. According to some tweets from a pair of well-connected Android reporters, the specific day for release at this stage should be August 21st where Android 8.0 (Oreo?) will be coming finally publicly available. Currently in Beta Version for Testers and Programmers, according to Google, the new Android 8.0 version is expected to deliverer many performance, security and user experience improvements over the latest Android Nougat 7.0 version introduced back in August the 22nd of 2016. Those improvements should help Google with the overall mobile search segment which in combination with the YouTube platform are the main drivers of growth for Alphabet Inc. In numbers, Google’s mobile search segment performed superbly this quarter, total advertising revenue was spurred upwards by increased mobile search use. Worth to note that both Android and IOS (Apple) devices use Google search as a default search engine and the increased usage of mobile devices over the last few years has resulted in Alphabet’s mobile search growth. As of their latest quarter, there are now over 2 billion monthly active Android devices around the world and keep increasing. Not only does this increase in users help mobile search growth but it helps their application store, Google Play and many more to generate more revenue for the company. When it comes to Google’s Stock analysis, price has been consolidating sideways since the 06.05.2017 unable to break above the recent highs at 1008.61 and break below recent lows at 915.31 indicating that the Investors waiting for a catalyst for direction, possibly the announcement of Android 8.0 OS in a few days or if later, the presentation of the Google’s new Pixels Smartphones devices which is are in direct competition with Apple’s iPhones. According to our proprietary system of equal legs extensions, the 3, 7 and 11 swings market sequence and Market Analysis via correlations, despite that GOOGL already reached the target of the equal legs for the cycle from 01.12.2015, we still believe that the stock can see new highs from current levels or at least a 3 wave bounce from lower against the yearly trendline. 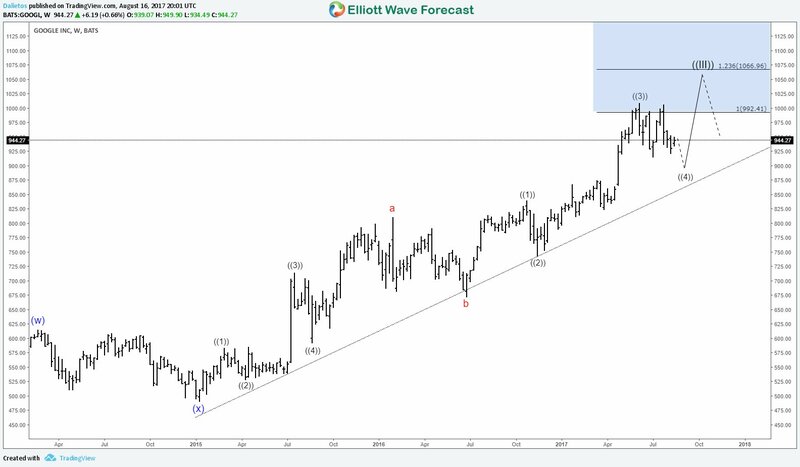 Below our Weekly Elliott Wave count which is calling for one more leg higher before the stock start to correct the cycle from 01.12.2017 at the 490.91 lows. In the shorter cycles, we are waiting to see GOOGL complete the consolidation from 06.05.2017 in waves ((iv)), ideally test the yearly supporting trendline, from there see a bounce and decide whether price will extend to new highs or do at least a 3 swing bounce before fail again. In either case, we expect the bounce against the trendline to create a Risk Free position and if the bounce fail to extend into new highs to get stopped at least Break even. I love these little weekly write ups. Keep up the good work. The latest announcement from Google, hinting at release of the new Pixel smartphone, has added vigor to the smartphone market that is already upbeat over the upcoming iPhone launch. Im in the market for a new phone... this may be worth the wait. Don't listen the naysayers, hold your positions and buy the opportunity prices that appear. Stay away of the noise. The last arrow is on 2017/Sep/27, and that is an UP arrow, which means it is THE GOOD TIME TO BUY this stock. 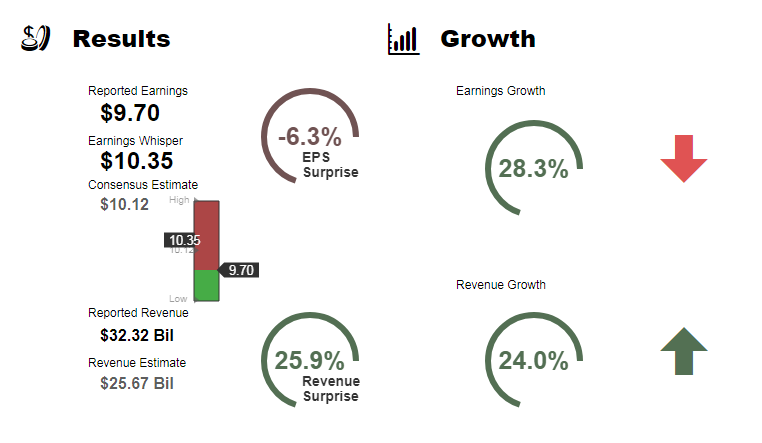 Earnings report after the close today. I might add if this drops more. They've got Ruth and everyone else who matters is there. Reversion to mean for '18 anyway. ER due out AMC today. 4revR - Taken and T0rm3nted like this. Alphabet stock initially dropped as much as 5 percent after it reporteddisappointing Q4 earnings, though it bounced back during the company's earnings call to settle around 2 percent down. The company posted strong revenue growth, but investors are still leery of rising costs and reduced margins. As usual, it was Google's swelling ads business, which posted $27.27 billion in revenue in Q4, that drove Alphabet's growth. Google's "other revenues" category, which includes its burgeoning enterprise business, hardware sales, and app store, posted $4.69 billion in revenue, bringing total Google revenue to $31.91 billion. Google is buying New York City landmark Chelsea Market for a cool $2 billion, The Real Deal reports. The tech company already leases 400,000 square feet, making it the building's largest tenant: Other businesses in the building include the Food Network and Major League baseball, as well as a bustling and popular food hall. Google already has a significant real estate footprint in Chelsea: When the company bought its current New York City headquarters in 2010, it paid a then-record $1.77 billion, Business Insider reports. Google's purchase is one of a number of moves by Silicon Valley giants into big cities, including Apple on Chicago's waterfront and Amazon's much anticipated second headquarters Quartz says.